Water is life, and it is widely used in our households for many purposes such as drinking, cooking, washing among others. What type of water runs in your home? Do you have soft or hard water? If the water running through your home is hard, here comes a perfect solution to help you enjoy the soft water. According to research done by Virginia Cooperative Extension, almost 85 percent of households in the United States use hard water. This is water with many minerals makes cleaning difficult as well as interfering with the performance of appliances. In the current world, many water softeners have been introduced to help homeowners remove calcium and magnesium from the water running in their homes. One of the most recognized companies with the best water softening technology is Fleck. The company makes different water softeners to suit needs of many people. 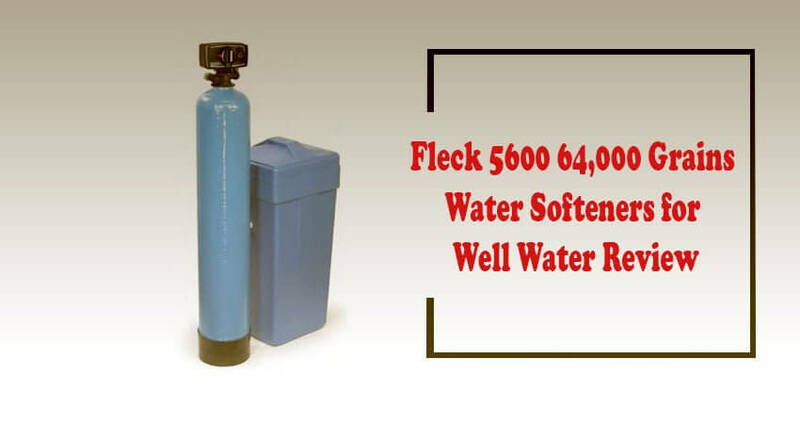 If you want to try out one of their best selling water softeners, try the Fleck 5600 and you will be happy using soft water at home. Here is a complete and detailed review of this unique product. Fleck is known for water softeners that are very easy to install. You do not need high plumbing expertise to install this unit. With just a few basics, you can simply handle the installation process. To ease your work, there is a free bypass featuring a male threaded yoke that makes installation easy. A satisfying warranty accompanies all products from Fleck. The whole unit carries a warranty of 5 years which includes the valve. It also has a warranty of 10 years for the two tanks that are included. All products from Fleck incorporate the best softening technology to give you soft water. In this case, the Fleck 5600 uses salt to remove the hardness in water. It has a big salt tank that can hold more salt pellets. Also read: Fleck Water Softener Review – Should You Buy? When you buy this product, you are still guaranteed of effective customer support. They have the best customer service, and this is something that makes more and more people to buy their products. So in case you would love to inquire anything after purchase, feel free to talk to their customer service team for the best services. For you to get the best results using this water softener, it is best suited for homes with up to three standard bathrooms. It is also perfect for 1-2 people where the grain per gallon of hardness is between 51-75. I bought this water softener, and it did not have the installation instructions. Where can I get one? Mine too did not come with the instruction, but my plumber knows how to install it. You can get the instructions online. Does this water softener come with a warranty? Yes, I bought it a few months ago, and I’m impressed with its performance. It carries a very satisfying warranty. If you want to install the unit by yourself, will you experience a difficult time? Installing this unit is very easy. The company also helps customers with programming and installation from Monday to Friday 9am-5pm. The type of water that you use in your home varies in different places. There are people who have soft water in their homes while others greatly suffer from having hard water. In this current hard economic situation, you cannot afford to buy purified water to suit all the water requirements in your home. The only cheap and efficient way of enjoying the soft water is buying a water softener. From this review, I know there are some positive things that you like in the Fleck 5600 water softener. This is a perfect solution to help you remove hard chemicals and minerals that make the water flowing in your house hard. The unit is available at pocket-friendly prices, and it is also very easy to install. Try it today and bid goodbye to hard water.